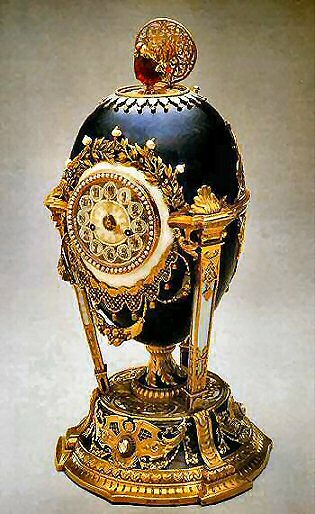 The 1900 Cockerel Clock Egg (previously known as Cuckoo Clock Egg) is made of varicolored gold, translucent violet, green, opaque lilac and opalescent white and oyster enamel, diamonds, rubies and pearls. The surprise is made of gold and natural feathers. 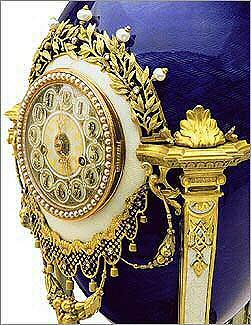 The Cuckoo Egg is Fabergé's rendition of an eighteenth and nineteenth century singing bird clock, technically related to the singing bird boxes produced in Geneva in the early nineteenth century. The body enameled translucent violet over a guilloche ground, supported by three slender pilasters enameled translucent oyster, the dial enameled in translucent white with stylized green flowerheads, the diamond-set Arabic numerals mounted on circular reserves enameled translucent oyster on sunburst grounds, the border of the dial set with pearls, above the dial an arch of foliage set with diamonds and pearls, below the dial an openwork apron set with diamonds and hung with tassels and swags of fruit, the shaped circular base applied with gold scrollwork and foliage, the top of the base enameled opaque white, the incurved sides of the base enameled translucent lilac. When a button at the top rear of the egg is depressed the circular pierced gold grille opens and the bird rises crowing on a gold platform, moving its wings and beak, the crowing finished it descends again into the egg and the grille closes, on the top of the grille the date 1900 is inscribed beneath a diamond. 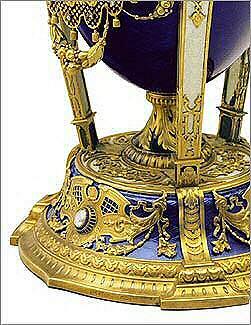 The Cockerel Egg is the first of four singing-bird mechanisms in Fabergé's oeuvre. The other three are the Imperial 1911 Bay Tree Egg, the 1904 Chanticleer Egg, made for Barbara Kelch and the 1902 Rothschild Clock Egg made for the Rothschild Family. Automated singing birds driven by compressed air or steam were apparently known in Antiquity. Around 1800 Geneva became famous for its exquisitely made enameled gold cages with singing birds. As in the case of watch mechanisms, which Fabergé generally procured from the firm of Henri Moser in Le Locle, the mechanism of the Cuckoo Egg may well also be of Swiss manufacture. The singing bird mechanism is simple, independent of the clock movement and activated by depressing a button. When first published in 1933, the Cockerel Egg was listed as "Clock Egg". In 1953, the singing bird in the Egg was labeled as a cuckoo apparently based on Eugène Fabergé's identification, a mistake that remained uncorrected for fifty years. More recently the feathered bird has been correctly identified as a rooster or cockerel, as it was originally listed in Fabergé's invoice. The delay may have been due to Fabergé's involvement as member of the Jury and exhibitor hors concours at the 1900 Paris World Fair, which opened with much fanfare on April 14 and closed November 12, having been visited by some fifty million spectators. Covering over 270 acres and with 76,000 exhibitors, it was the greatest exhibition of its kind ever held. The fair marked the apogee of art nouveau, a style that had emerged in Paris in the early 1890s and was flourishing by 1897. Its chief exponent was René Lalique, the brilliant artiste bijoutier, who was awarded the Legion of Honor and a Grand Prix for his exhibits. Fabergé, too, received the same high distinction and a Gold Medal for his exhibits, his son Eugène was created Officer of the Académie Française and the firm's head workmaster, Michael Perkhin, was awarded a Bronze Medal. 1927 one of nine Eggs sold by the Antikvariat to Emanuel Snowman of Wartski, sold by them to Mrs. Isabella Lowe around 1949, reacquired from her in 1953 and sold in 1970 to Robert Smith of Washington, D.C. Sold at auction on his behalf at Christie's, Geneva, in 1973 to Bernhard C. Solomon of Los Angeles and sold by Solomon at Sotheby's, New York, in 1985 to Malcolm Forbes. 2004 sold by the Forbes' family to the Vekselberg Foundation/The Link of Times foundation, Russia. 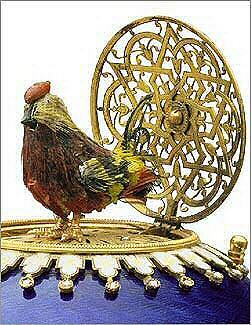 The Cockerel Egg is one of Fabergé's Eggs with a clock. To see them all, click here, and to see the Singing Birds, click here! With thanks to my Fabergé friend Pouline, herewith an early Fabergé photograph showing the now lost pearl decorating the swag of the dial. 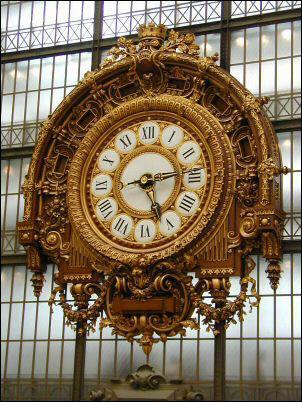 This clock is now overseeing the large hall of the Musee d'Orsay in Paris, originally built as railroad station and hotel in anticipation of the 1900 Paris World's Fair (l'Exposition Universelle). Station and hotel were inaugurated on July 14th, 1900, the same year the Cockerel Egg is dated. As the Quay d'Orsay clock is visible on pre-1900 architectural drawings for the station, Fabergé must have seen the clock. He had a number of his now famous Easter Eggs exhibited on the Expostion, where he was awarded a Gold Medal and the prestigious French order the Legion d'Honneur. I have, however, not been able to find if the Cockerel Egg was Exhibited in Paris in 1900. 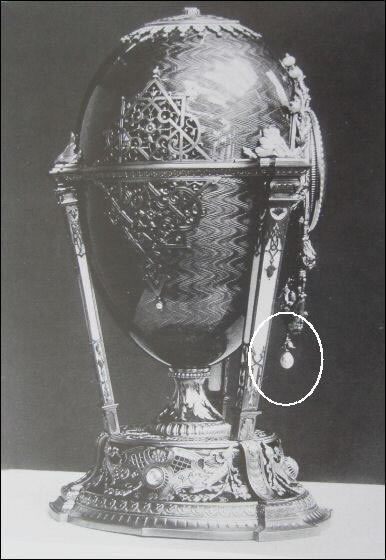 Fact is that, contrary to usual procedures, the bill for this egg was not received by the Imperial Cabinet until January 1901, and that this "was probably due to the fact that Fabergé was away from St. Petersburg for an extended period of time. He participated as a member of the expert commission of the 1900 World Exhibition in Paris which ran from April to November ". As to the clock, nowhere on the internet could I find any background information on this clock, nicknamed the "grand horloge d'or" (big golden clock). I wrote the museum, now the owner, but unfortunately they too could not give me any information on the designer or the clock maker, so any information is most welcome! We probably will never find proof that the Cockerel Egg and the 1900 Exposition Universelle have more in common than the year 1900, but it is somehow nice to think that Fabergé found inspiration for the 1900 Easter Egg in Paris, France. Tatiana Fabergé, Lynette G. Proler, Valentin V. Skurlov, The Fabergé Imperial Easter Eggs, 2000, 146.